Yarn dyed in hank form (i.e. endless bundle of specified length) or in the form of package, namely cones, chees or bobbins. The first patent was issued to Obermaier for package dyeing around 1882, whereas hank dyeing has a much longer history and probably dates back to antiquity when yarn was simply suspended on wooden poles and turned by hand. It is still preferred in the cottage sector as dyeing (wet processing) may be carried out manually in an earthen pot or cemented tank. Hank form is very convenient to handle and to transport. May spinners are still equipped with hank-reeling machines as the last operation in the spinning process. It is often claimed that with certain products, a better quality is obtained by the hank route. The products, normally hank dyed, are cotton doubled-yarn, hand-knitting yarns in wool, nylon, acrylic and their blends, carpet yarns and acrylic yarn for machine knitting. Hank dyed yarn has a fuller bulk and softer handle. Levelness may be inferior to package-dyed yarn. Hank reeling and back-winding is costly and may generate waste. More controlled dyeing with better levelness and fastness. Lower liquor ratio causing savings in water, effluent, energy, dyes and chemicals. Larger control on the process makes automation easier. High temperature dyeing and rapid dyeing possible. Texturized yarns for both weaving and knitting. 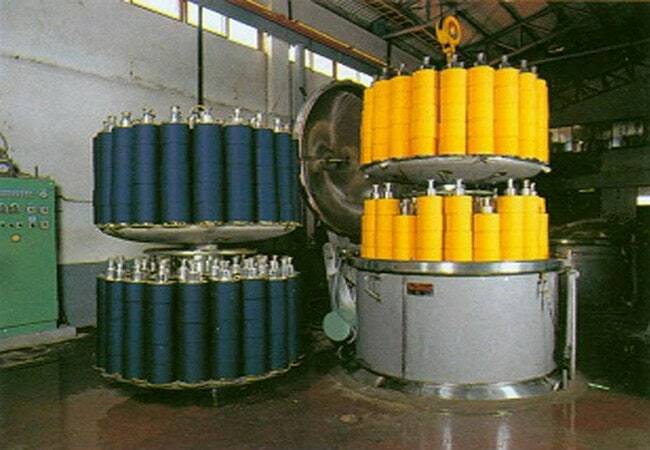 Wool or acrylic yarn for apparel and furnishing. Savings in space, energy, water, chemicals etc.